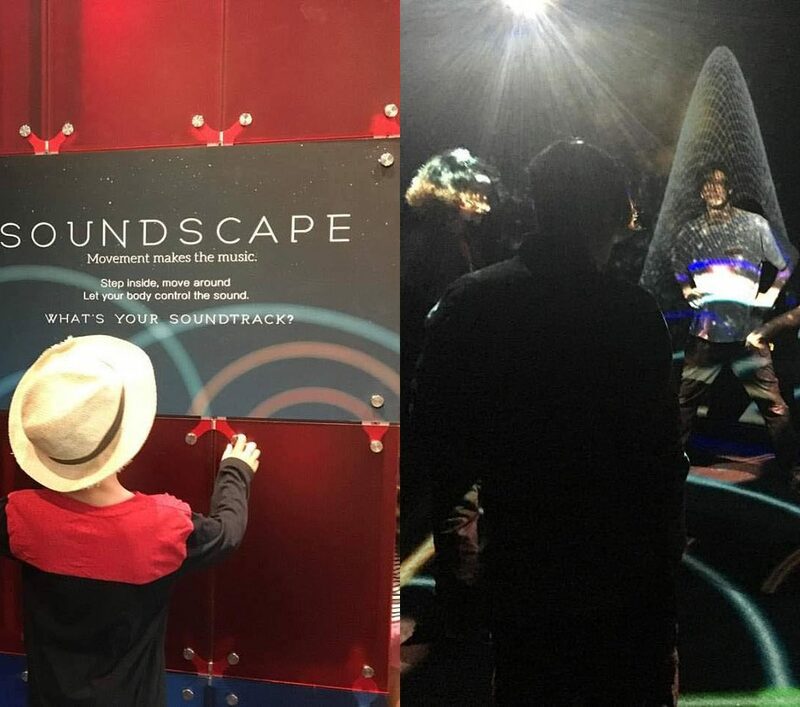 Alt Ethos and the Fort Collins Museum of Discovery invite you to the grand opening of Soundscape, a real-time audio/visual experience. Step into this immersive exhibit where physical presence creates music and live visuals. The opening coincides with FCMoD’s David Bowie LaserDome event. Tickets for the LaserDome can be purchased here. The opening event is free and open to the public with hor d’oeuvres and non-alcoholic beverages provided alongside a cash bar. The opening will be held on Saturday, June 24, 2017 from 7pm to 10:30pm at the Fort Collins Museum of Discovery. As you walk through the Music and Sound Lab a mysteriously glowing room catches your eye. Out of curiosity you step inside and soon discover that your position inside the room is creating music in real time. The intimate scale of the room widens below you as you walk suspended in space. The wall pulsates over your coordinates on the floor. As the moments pass, others join in creating an ensemble of organic sound. This exhibition was conceived through the collaboration of Alt Ethos Experiential Design studio and staff at the Fort Collins Museum of Discovery. Alt Ethos custom designed this interactive exhibition to create a meaningful experience for patrons to learn, reflect, and have fun through hands-on explorations. Visitors control a multichannel sound system and projection-mapped visuals through physical movement. The Fort Collins Museum of Discovery (FCMoD) is a history and science museum filled with interactive exhibits and fascinating artifacts which tell the stories of Northern Colorado. The museum creates meaningful opportunities to connect body movement to sound through hands-on and collections-based explorations in science and culture. Alt Ethos is an experiential design studio that synthesizes digital and physical environments into unexpected realities. Alt Ethos are artists, designers, and engineers creating innovative projects for the modern world. They meld various forms of light, sound, and creative technology into shared interactive experiences. Please join us for the opening of Soundscape, an instrumental environment exhibition. This unique exhibition changes the ways in which we view music and exploration in museums. The opening will be held on Saturday, June 24, 2017 at the Fort Collins Museum of Discovery at 408 Mason Court, Fort Collins, Colorado.